On the Boston Globe Best Seller List for Non-Fiction Paperback in 2003, “Death and Letting Go” is a guide for understanding death as a continuation of life. It provides insights into the meaning of death and guidance for facing challenging life transitions. 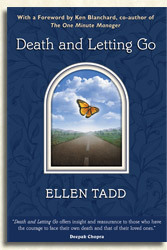 “Death and Letting Go” offers quiet reassurance and encouragement for living life with greater joy and serenity. Visit Amazon to purchase copies of “Death and Letting Go.” Also available in French.